We may be biased, but we have the BEST volunteers! They are so amazing that we are dedicating a blog series to their stories and the impact they’ve had on the work that Touch A Life does around the world. The first volunteer we are featuring is Sylvia Brown! Read a little about her and her story in our interview below. 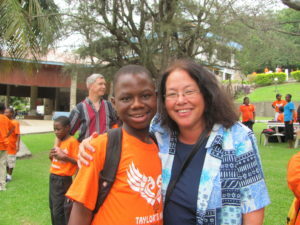 Sylvia and Raul at the Touch A Life Care Center in Ghana. I was born in Houston, Texas, and grew up in Dallas most of my life, except for one year in Wyoming and five years in New York City. I have four grown children, and I have 10 grandchildren ranging in ages from 6 years old to 21. How did you first hear the Touch A Life story? After my husband passed away in 2009, I started reading different books related to grief and I read Jantsen’s Gift from the library. After reading the book, I wanted to find out more about the organization and then found out they were based very close to my home in Dallas, so I called and asked if I could volunteer. I am off work every other Friday so I try to volunteer in the Touch A Life office on those days. What really triggered you to reach out to our team and get involved first-hand? I really appreciated the sincerity of the staff and the closeness of the Touch A Life office to where I live. What sorts of things have you accomplished as a volunteer at Touch A Life? As a volunteer, I write thank you notes and help put together presentation packets. I also have prepared boxes that were sent to Ghana – basically anything they need me to do! How has your role as a volunteer changed your life perspective? As far as changing my perspective, it has just brought an awareness to other parts of the world and what we can do when we work together. I was able to visit the Care Center in Ghana in 2013 and it was so nice to see the children and get to know them on a more personal level. What would you say to others who may want to get involved with the work Touch A Life is doing? I would say that this is a very worthwhile organization and these children’s lives have been turned around. They have so many more opportunities and they are so grateful. If you are interested in volunteering with Touch A Life, read about our opportunities or contact our team.